One of the advantages of Confluence is that its revision history supports audits: Each version of a page is always visible, comparable with other versions, and an earlier version can be restored, if required. There are many scenarios in which this functionality is useful, or even necessary. 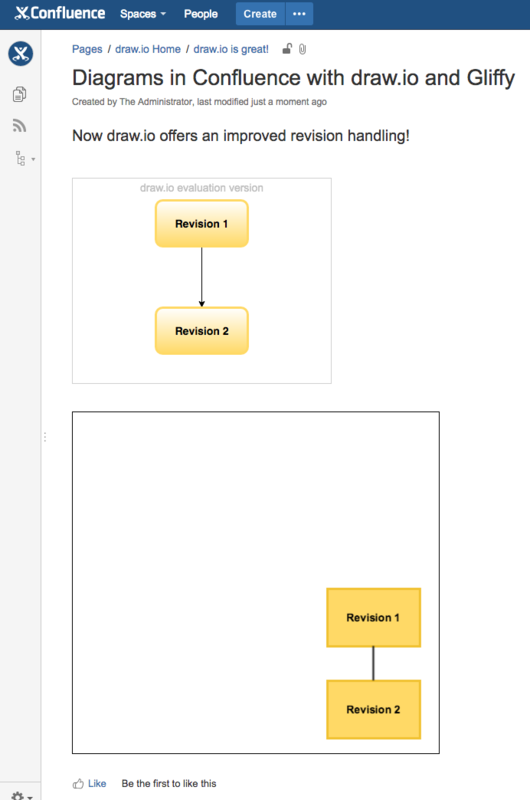 But what happens with diagrams that are embedded in Confluence pages? 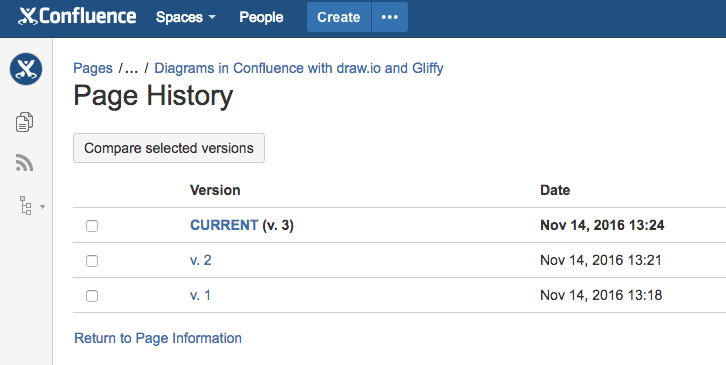 draw.io and Gliffy are the two most mature add-ons that support professional diagramming within Confluence. But the difference in how diagram versions are handled is massive: draw.io supports full version control integrated with Confluence's version history, but Gliffy only has rudimentary version control within the diagram itself (not integrated with the version history in Confluence). This is best demonstrated by creating a new Confluence page in which a diagram will be added. Now, we will add two basic demonstration diagrams — a draw.io diagram on the left, a Gliffy diagram on the right — and save the page. This version is now saved as "v.2". Note that draw.io does not have an Edit button when in the viewing mode in Confluence (the toolbars in both diagramming tools are displayed on mouse-over). There is a simple reason for this in draw.io - the diagram is integrated into the page edit workflow so that each edit is versioned. In contrast, Gliffy allows you to edit the diagram without editing the Confluence page. That means that each change to the diagram is not tracked in the revision history of the page. But worse, a new page version is never created when a Gliffy diagram is edited, whether the page was being viewed or edited at the time. We can see below that a new version was created. 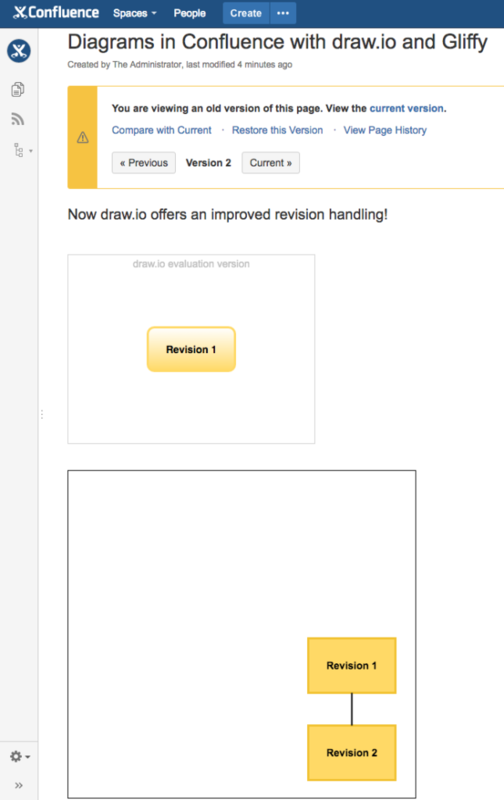 But as mentioned, version 3 of our demonstration page was created purely by editing the draw.io diagram. If we had only edited the Gliffy diagram, no new version of the page would have been tracked. You can clearly see the difference between draw.io on the left hand side, and Gliffy on the right hand side: The draw.io diagram on the left is non-edited diagram (correct), but the right shows the most recent version of the diagram (from "v. 3"). It does not matter which version of the page you look at, or how often a Gliffy diagram is modified: The Gliffy macro shows only the most recent version of the digram and none of the earlier versions. From Confluence's point of view, there are two versions — a page without the Gliffy diagram, or a page with the most recent version. It is therefore very difficult to roll back to an earlier version of a Gliffy diagram. To do so, we must work within Gliffy's internal revision history. In earlier versions of Gliffy, there was not even a preview function, so you had to guess which version was the one you wanted to roll back to. With a draw.io diagram, all changes are visible as they are saved each time the page is saved. Changes are not only tracked, but earlier iterations can be previewed and with a mouse click, you can roll back to an earlier version. With respect to transparency and traceability, being integrated with the Confluence's revision history, draw.io is much more advanced than any other diagramming tool. 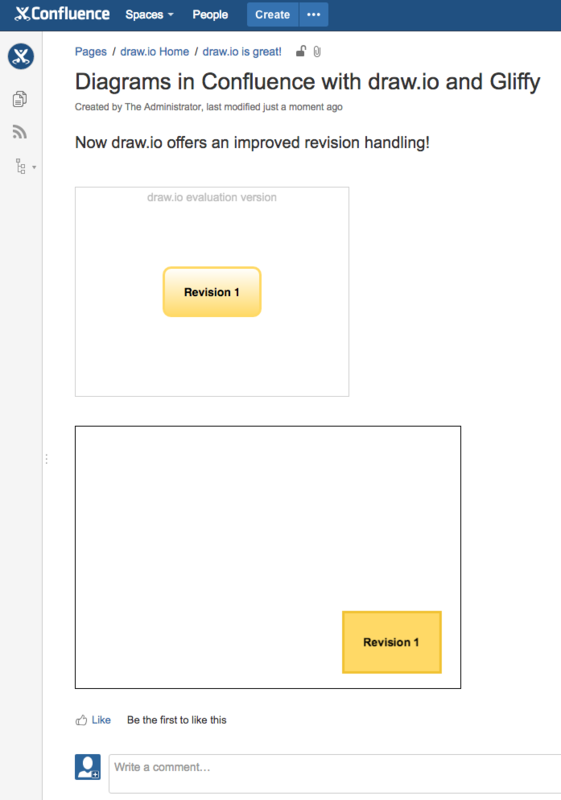 If you want to learn more, you can test draw.io for free and without obligation in a Confluence or JIRA environment. JGraph and //SEIBERT / MEDIA have partnered to offer you the best technology and individual consultation and licensing from a single source. We are happy to assist you in the evaluation, licensing and adoption of draw.io — please talk to us!